Summer is right around the corner and for many of us that means our calendars are about to get jam packed with fun activities, events, and vacations! This summer we have something else to look forward to: The Traveling Shirt Contest! Next time you're getting dressed for one of your summer activities, we'd like to encourage you to wear your Morrison Chiropractic t-shirt. Why? We're glad you asked! 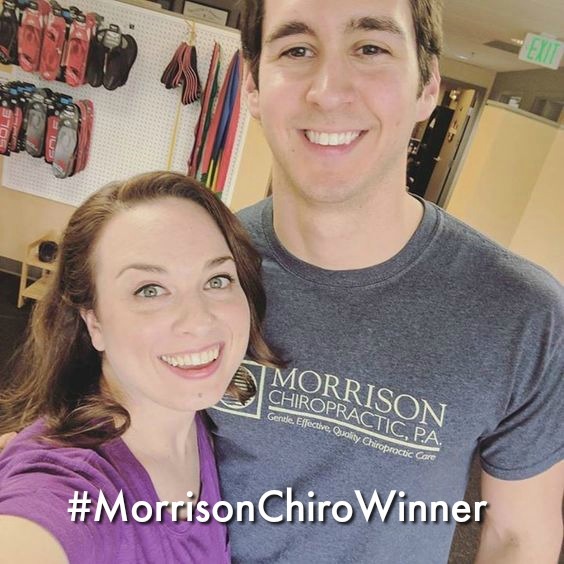 Post the picture on Facebook, Instagram or Twitter using the Hashtag #MorrisonChiroWinner AND tag Morrison Chiropractic in the photo. Voila! For each photo you post you receive an entry into our giveaway...so post early and post often! Don't Have a Morrison Chiropractic T-Shirt? No problem! You can get a t-shirt for FREE by referring a patient to our practice OR you can stop by our front desk and purchase one for $15. We can't wait to see all the fun things you're doing this summer while wearing your Morrison Chiropractic swag! Do you need to tone up, trim your waistline, strengthen your core and become stronger while burning off fat? You aren't 100% certain that lifting weights is helping you get the body you want and you need to get in shape in the fastest time possible? Consider that, occasionally, life happens and there are times when you can only hit the gym two or three times a week. Or, if you find it simply too hard to stick to a workout plan, why not try a full body workout program? Getting into shape, becoming stronger, more fit, have more muscle tone, trim inches from your waistline AND strengthen your core is all about spending hours at the gym, right? Yes, hard work is still needed. Like anything in life, you get out of your workouts what you put in. The full body workout can help you progress and is easy to fit into your schedule. Full body training is vastly underappreciated. Too bad, because it works exceptionally well. With full body training you burn more calories in less time. This method of training focuses on major muscle groups working together in compound exercises. Because of this, a greater energy demand is placed on your metabolism than with isolation exercises. It takes more energy to require a group of big muscles to work together. More energy expended equals more calories burned. Let's find out what full body workouts are all about and what the difference is between full body strength training and body part training. If your workout includes one exercise from each category, you have a complete Full Body Strength Training Workout. Additionally, performing full body movements requires core engagement during every lift. By utilizing high tension techniques - your entire core is being worked without having to do extra crunches. At ForeverStrong a customized movement combination is incorporated into a personalized training plan for each client. At each training session the client focuses on a number of combined movements to perform that day. Each client’s program is personalized to his/her goals and the amount of work is determined based on those goals. The amount of work progressively increases over the eight week period. In short, If your workouts target just one or two specific muscle groups each session that is body part training. Body part training is a time-waster for most people and requires 3-5 days a week of strength training plus another 2-3 days a week of cardio. Do you have 10+ hours a week to spend in the gym? Body part training doesn’t make as significant of a contribution to fat loss. It also won’t create a great enough energy expenditure to help you burn stubborn body fat. So, what are the top reasons to use full body workouts? At ForeverStrong, we want each client to Invest time in learning the proper form. Lifting heavier weights requires skill and takes time for you to become proficient. Look for a coach who focuses on technique, not just hard work. In some cases, a corrective movement strategy can supplement your workout routine to help you reach your goals faster. We believe in our Full-Body-Five method and would like you to experience it for yourself. If you are unable to sign up for an 8 week ForeverStrong program, we would like to send you a complimentary full body workout. If you are interested, please send an email to info@trainforeverstrong.com to get your copy. Please reference this article. Our Personal Trainers have helped hundreds of people in Howard County and the surrounding areas lose weight, tone up, and become stronger. Our neighbors in Highland, Clarksville, Columbia, Burtonsville, Olney, Ashton and Silver Spring love their personalized training program. Please visit our website: www.trainforeverstrong.com to see for yourself. Don't forget that Kelly Scott will by giving a seminar at our Clarksville location on Tuesday May 2nd at 7:30pm. For more information, please visit the event page! Stop Icing & Start Moving! You likely got better, but it took 4 weeks before you really felt 100%. What if I told you there was a better way? What if resting and icing was slowing down your healing? What if it’s all been a myth perpetuated over the last several decades? Icing slows inflammation. You’ve probably been told that this is a good thing. However, open any physiology book and you’ll see that the three necessary steps to healing are: Inflammation, remodel, and repair. Icing prevents the release of a hormone called IGF-1 in the localized tissue that is necessary for the remodeling process to start. Icing prevents healing cells from entering the damaged tissue. Ice is a vasoconstrictor, which means it shrinks the diameter of the capillaries in the tissue, preventing the flow of blood and lymph into that area. A smaller tube means the good stuff can’t get into the area, and it also means the bad stuff can’t get out! Icing causes additional tissue damage. Bringing the temperature down low in the injured tissue can kill healthy tissue cells around it. It’s like taking a shotgun to the area instead of a sniper rifle. You can’t prevent the collateral damage. Icing increases swelling. Once you’ve cooled the area and caused the vasoconstriction, the body responds with a rebound effect, shuttling more pressure and fluid into that area in an attempt to raise the temperature and pressure back to homeostasis. In effect, you directly cause an increase in the very thing you were hoping to lessen. Icing shuts off the body’s signals that alert you to harmful movement. Ice effectively numbs the area, which means you could easily perform movement that damages the tissues without even knowing it until after the local temperature has returned to normal. The analogy is similar to why you need pain signals to prevent keeping your hand in a flame. Pain tells you to stop doing something. If you are numb...you can’t feel those signals,which increases the likelihood of greater acute tissue damage during movement while the temperature is so low. So if icing and rest are the enemies of tissue healing, what can we do to speed up the healing process after injury? The answer is simple. MOVE! More specifically, move without triggering the pain response. If we cause pain, we MAY be causing more tissue damage (this is debatable, but we'll save that for another article). So the key to healing is frequent, painless, low intensity movement of the surrounding soft tissues and joints. Increased blood circulation. The healing cells are being shuttled to the damaged tissue through dilated blood vessels and capillaries. The wider the vessel diameter, the more soldiers get to the fight. This is literally the opposite of what happens if we ice the area instead. Increased lymphatic circulation. Your lymphatic system uses your muscle contractions as a pump, while your blood uses your heart as it’s pump. The lymphatic system is used to remove the waste products from the damaged area. Without the muscle contractions happening frequently, you cause pooling of those waste products and delay healing. Resting the area and icing literally causes the pooling of that waste to happen faster, delaying healing. Increased hormonal activity. We mentioned things like IGF-1 earlier. The more painless movement you perform, the better the hormonal environment to facilitate the recovery process. But what kinds of movement should we perform? Ideally these movements should be simple, with low levels of skill. This makes them easy to learn and hard to mess up. They should also have very little eccentric contraction, because this is the main form of contraction that causes muscle damage. If we are already injured, why would we want to further damage the surrounding tissues with heavy eccentric contractions? And finally, movements should provide a fluidity in their performance, allowing the person to maintain low intensity, painless movement for longer period of time to encourage healing. Obviously, it should go without saying that learning and perfecting these exercises should occur in supervision with a qualified personal trainer or strength and conditioning coach. Ideally you find someone who has dedicated their lives and career to prioritizing good technique and intelligent programming. Avoid the hobby trainer who simply has a weekend certification or two. And this coach/ trainer should be eager to coordinate your exercise program with your physician, chiropractor, or physical therapist. Any coach who avoids partnering up with your doctor is not interested in acting on behalf of your best interests. Chronic pain sufferers often look for a source of their pain so they can make changes and reduce their pain levels. For some chronic pain sufferers, making lifestyle changes is one of the best ways to minimize their pain. We share some tips for changing your lifestyle to address your pain here. One of the most significant lifestyle changes you can make to impact your chronic pain is to reduce your stress levels. Pain causes stress, and stress causes pain; with better stress management, you can avoid this cycle and manage your pain more successfully. To begin reducing stress, identify your triggers. For most people, stress triggers include work, relationships, home life, lack of healthy habits, and negative thinking. Once you have identified your stress triggers, work to reduce them. Your home also may cause stress. If your home is cluttered, you have difficulty focusing and processing information, which can lead to headaches and tension. Sorting your belongings and donating gently worn clothing will reduce some clutter and alleviate some stress; you’ll also feel good about donating your items. Organizing your remaining belongings will reduce your clutter even more and create an environment that is less stressful. Studies show that our environments affect our stress levels and pain levels. In fact, being in a stressful environment elevates blood pressure, heart rate, and muscle tension in addition to weakening the immune system. Because more than 67% of people opt for a natural setting when looking to reduce stress, people with chronic pain need to include being in nature in their lifestyle. For people with chronic pain, there are several options for making nature a part of your lifestyle. You can go for nature walks, take hikes, sit outdoors, or make a garden. During winter, you should add plants to your home. Making an herb garden for your kitchen and placing plants in rooms you spend most of your time in will help improve your mood, have more positive thoughts, and reduce your overall stress. Some people with chronic pain also listen to natural sounds to manage their pain. Studies show that music therapy may have an immediate impact on pain; the reason may be that music works like relaxation and guided imagery techniques to strengthen the part of the brain that controls the body’s healing process. Music therapy improves mood, relieves anxiety, and activates the sensory pathways of the brain that provide pain relief. Proper, restful sleep helps reduce fatigue and irritation and your perception of chronic pain. It is much easier for people who get enough rest to deal with their pain than those who don’t. Strategies for getting better sleep include sleeping in a cool bedroom at around 65 degrees, keeping your bedroom neat and tidy, eliminating digital devices from the bedroom, maintaining a consistent sleep schedule, and using your bed for sleep instead of work. Limiting your intake of alcohol is important to managing your chronic pain. Alcohol consumption worsens sleep issues, as drinking alcohol within an hour of going to bed disrupts people’s sleep cycles significantly. Chronic pain sufferers also turn to alcohol as a pain management strategy and increase the likelihood of alcohol abuse and alcoholism. Reducing the amount of alcohol you drink or completely eliminating it from your diet is one way to ease your chronic pain. Some chronic pain is alleviated when people manage their weight and take care of themselves. Eating a healthy diet rich in fruits and vegetables can lead to weight loss that takes stress off your joints and helps you move more easily. Vitamins and minerals in healthy foods also help combat inflammation, which is a source of chronic pain. Most people find that a healthy diet gives them more energy, which prompts them to exercise. Exercising at least 20 minutes a day helps with weight loss and reduces pain and stiffness. By making a few lifestyle changes, you can reduce your chronic pain. It’s important to take steps to reduce stress, spend more time in nature, get better sleep, avoid alcohol, and eat a healthy diet and exercise if you want to minimize your pain. It’s not sitting or standing that are necessarily good or bad, it is our lack of movement and exercise that’s doing us in. The American College of Sports Medicine has a very ambitious program called “Exercise is Medicine” that seeks to educate physicians and bring personal trainers, athletic trainers, exercise scientists, kinesiologists and others into the realm of medicine and health care. Turns out, exercise along with smart dietary choices are probably the most positive changes you can make to benefit your health. Regular exercise prevents ameliorate or even reverses the effects of many degenerative conditions and diseases. Often medication can be reduced or eliminated. Exercise has been shown to improve your general physical preparedness (G.P.P.). Simply put, regular exercise can maintain or even increase your capacity to perform activities without sustaining injury. As we become sedentary and “age in place,” we lose our capacity to do things. Every summer I see patients who return from their European vacations, having walked the streets of Rome, ascended the steps to the Acropolis r toured the castles of the British Isles with all kinds of “over use” syndromes of their musculoskeletal system. Name an “–itis” – bursitis, tendinitis, fasciitis, myofascitis – and they have it. Many have spent 8-10 hours of the 250 work days a year at a desk then commute an hour home to slump into the couch and watch TV for the evening. That’s how you lose your GPP. People expect their body to behave as it did when they were 25. On vacation they may walk 20,000 steps in a day, lug suitcases and climb stairs. Something has to give…. Reduces the risk of developing Alzheimer’s disease. Exercise is associated with reduced risk for incident dementia among persons 65 years of age and older. Larsen EB et al.Annals of Internal Medicine 2006; 144:73-81. Reduces the incidence of high blood pressure and heart disease by approximately 40%. Cardiorespiratory fitness is an independent predictor of hypertension incidence among initially normotensive healthy women. Barlow CE et al. Am J Epidemiol 2006; 163:142-50 Exercise in the prevention of coronary heart disease: today's best buy in public health.Med Sci Sports Exerc. 1994 Jul;26(7):807-14. Here is a perfect soup recipe for this time of year provided by Gina Rieg, owner of Simplified Wellness For you. Enjoy! 2 – 3 medium carrots (or sub more squash, or other root veggies like rutabagas). Peel the butternut squash, cut it in half and de-seed it. Then cut into chunks – about 1 inch. This will be about 6 – 7 cups. Cut the carrots into about 1 inch coins. Peel and cut the onion, into about 1 inch pieces. Put the squash, carrots and onions in the slow cooker or Instant Pot. Add the broth, coconut milk, salt and herb/spice blend of your choice. If using a slow cooker, turn on LOW for about 6 hours OR on high for about 4 hours. If using the Instant Pot, use the “soup” function and make sure it displays 30 minutes and normal pressure. Safely quick release when the time is up. Once everything is cooked, use a stick blender in order to puree the soup to your desired smoothness or chunkiness. You could also use a blender and blend in batches. Chronic pain also presents a substantial economic and public health burden. The following map, based on current figures and census data on state populations, estimates that 116,000,000 Americans experience chronic pain. Imagine every human being in the shaded states experiencing ongoing pain. (1) Imagine the entire shaded region, 116 million people, where every single individual experiences ongoing pain every day. Every person you see on the street, on a bus, at home, at work… including you, is in pain almost all of the time. I think we need more than a Pain Awareness Month to address this, but it’s a start! Chronic pain creates a major economic burden, at a cost of $560-635 billion annually in direct medical treatment costs and lost productivity. By comparison, the entire annual US 2015 Military Budget was $601 billion. By definition pain is an unpleasant sensory and emotional experience associated with actual or potential tissue damage, or described in terms of such damage. (2) When an injury first occurs and pain is experienced we call it “acute”. Acute pain is a message from our internal alarm system, using pain to protect the injured area and create actions that get us out of danger. The amount of pain we experience is NOT directly related to the amount of tissue damage, rather it is influenced by perception, thoughts, beliefs, fear, society, health care system, culture. Our alarm is activated! Currently, opioids are the intervention most often used for management of chronic pain in the United States. The idea is to inhibit the signals associated with pain in the brain. What is being done to better address the issue of chronic pain? Unfortunately traditional medical education does not adequately prepare physicians for handling the complexities of chronic pain. “One in 3 patients sees a primary care physician (PCP) for chronic pain yet most PCPs receive no training in this field.” (6) More medical schools are offering courses that provide advanced pain education. In reality, chronic pain has social, psychological and physical (genetic, biological, nutritional, etc.) components each contributing in varying degrees to the experience of pain and whether or not the person will go on to develop chronic pain. Patients, health care providers and society need to become educated about all these aspects of chronic pain in order to create meaningful change, improve outcomes and curtail costs. At the Center for Integrative Health and Healing, we have the opportunity to assist many patients with chronic pain problems. The vast majority of these patients have what is termed chronic musculoskeletal pain. These patients do not have underlying nerve or spinal cord damage following a surgery, trauma or disease which is termed neuropathic pain nor do they have cancer related pain. Typically their pain problem started as some form of acute muscle or joint injury or persistent biomechanical stress or some times for no reason at all and now their pain persists well beyond the normal tissue healing time of a few weeks to a few months. This pain can be unrelenting, spreading and quite severe. Providing comprehensive, understandable pain education to overcome fear and learn self-efficacy. IASP, 1994. IASP (International Association for the Study of Pain). 1994. Part III: Pain terms, a current list with definitions and notes on usage. In Classification of chronic pain, 2nd ed., edited by H. Merskey and N. Bogduk. Seattle, WA: IASP Press. Pp. 209-214. Califf R, Woodstock J, Ostroff S. A Proactive Response to Prescription Opioid Abuse. February 4, 2016. DOI: 10.1056/NEJMsr1601307. Clin J Pain. 2013 Mar 1. Dr. Brian Morrison has spent many years working with the University of Maryland School of Medicine to teach 4th year medical students about pain management. Specifically he has spent much of his time teaching his student alternative treatment methods to decrease the over-prescription of opiods, given that our country is currently facing incredibly high fatality rates due to the current opiod epidemic. Earlier this week Dr. Morrison was interviewed on ABC-2 WMAR's In-Focus segment about the impact that this epidemic is having and the other options that physicians have when treating patients with chronic pain. To watch the interview click HERE! This happy, healthy recipe is brought to you by Gina Rieg of Simplified Wellness for You. 1/4 cup raw cacao powder + 1 cup of almond butter + 3 tbsp maple syrup/honey (this mimics "nutella" but this is a real food version)! Allow to cool for several minutes, then enjoy! Note: You could also make these as muffins! Bake for 12-16 minutes. Gardening season is upon us! And you know what that means, right? Low back pain! Let's review a few tips to help get you through the season without difficulty. 1) Start each session with 5-7 repetitions of the cat-camel (or cat-cow) exercise. This exercise is performed from the quadruped position, or the on-all-fours positions, with your hands placed directly under your shoulders and your knees directly under your hips. Then begin to slowly alternate between flexion and extension of your spine. Do so by arching your back towards the ceiling and lowering your head towards the floor, then lower your belly towards the floor and look up towards to ceiling. Avoid extremes of motion if they cause pain. This is not a stretch, rather a continuous movement though the range of motion. 2) Warm up with a 5-10 minute brisk walk to get the blood flowing. This is a great way to dynamically warm up instead of stretching. There is no evidence that suggests stretching before an activity prevents injury. Actually, the common stretch of bending over and touching your toes can increase the likelihood of injury before activity. 3) Vary your gardening tasks, pruning, raking, digging, etc. Do not continuously perform any particular activity for a long period of time. Planning your tasks ahead of time can help with this, as well as placing your tools in a bucket for easier transport. When you do need to be in a kneeling position, try to use a kneeling pad or a kneeler equipped with handles to help with getting up and down from the ground. You can also consider using tools with an adjustable length handle to allow working from a standing or seated position. 4) Bending and lifting should be performed using the hip-hinge bend technique with all of the movement coming through your hips instead of your low back. Add a bend to your knees and keep your back in a neutral position to minimize stress on the lumbar spine. The power of your lift should come from your buttock and legs. It is also critical to abdominally brace (tense the abdominal wall as if you were anticipating being struck in the gut) during the lift to increase the stability in your low back. 5) When shoveling, spread your feet to give create a wide supportive stance and avoid twisting your body. Instead, picot and re-position with your feet. Another option is to hire the kids around the neighborhood to assist you. Gardening is a physical activity, and you will protect your back if you exercise regularly and follow the tips listed above. Just as an athlete would train and condition for his or her sport to avoid injury. If you need to improve flexibility, gently stretch AFTER gardening or exercise. Consider the cat-camel, sphinx, child's pose etc. for stretching. Good luck out there and happy gardening! Involved in a Minor Car Accident? Be Sure to Visit Your Chiropractor. I recently watched a webinar on auto accident injuries. I wanted pass along a few pieces of information that can help minimize your injuries in the unfortunate event that you are involved in an accident. Keep the top of your headrest set at a height that matches the top of your head. When the headrest is too low, your neck and head can be propelled upward and backward, over the top of it, increasing injury to the neck. If you see a vehicle approaching from the rear and it looks like an accident is going to happen, firmly grasp the wheel and brace your torso and head backwards into your seat with stiff, but not locked, arms. Minimizing your body's movement reduces injury, generally speaking. It is thought to be a wives tale, the story of the drunk in the accident that walks away unscathed because he was so relaxed. Also, keep your foot firmly on the brake. In this was you keep your car from accelerating rapidly and out of control in the case of a collision from the rear. Even low speed accidents can injure muscles, joints, and nerves. Chiropractors are experts in managing these types of injuries and we can take fast action to alleviate your symptoms. As always, these are thoughts to consider if you're involved in an auto accident, but they should not be taken as a substitute for your primary care doctor's advice. A huge thanks to my good friend, John Kibby, a great chiropractor in Crofton, MD for sharing this information! We've learned in recent years that taking a nap every day is beneficial for overall health. However, our hectic and ever changing schedules rarely work out to allow the perfect 20 minute 'power nap'. Are there still health advantages if you only have 10 minutes to nap? Is napping for 1 hour unhealthy? Keep reading and all your questions about napping will be put to bed. According to a study conducted by Cornell University a 10 minute nap, "had the greatest immediate improvement in alertness and cognitive performance." Another study found in the PLOS ONE Journal concluded that a 30 minute nap following lunch will help increase your ability to switch between tasks more efficiently. Make sure to set an alarm for 60 minutes or less, as a 2012 study in the Sleep Journal found napping at midday for greater than 60 minutes correlates to increased risk of suffering from a cardiac event. Kick inflammation to the curb by drinking a cup of turmeric milk also known as 'golden milk'. The health benefits of all the listed ingredients are many, however, the stars of this recipe are turmeric and ginger. Turmeric has strong anti-inflammatory and antioxidant properties. Ginger helps digestion, soothes gastrointestinal upset, and also combats inflammation. Blend, heat, and enjoy! Pour into favorite mug and enjoy! Upper Cross Syndrome - What is it & How Can it be Prevented? How many of you star your day with a long car ride followed by sitting at a desk for 8-10 hours? Then cycling through this 5-6 times a week? Sitting and a sedentary lifestyle are major culprits of neck and upper back pain, most commonly called Upper Cross Syndrome (UCS). In UCS we see patterns of muscles imbalance and poor posture. Muscles imbalance is seen with alternating groups of tight and weak muscles. The tight muscles could include upper trapezius, levator scapulae, suboccipitals, and pectorals. The weak muscles could include rhomboids, lower trapezius, and neck flexors. This means there is weakening and lengthening of the posterior upper back and anterior neck muscles along with tightening and shortening of the opposing posterior neck and chest muscles. This imbalance can accelerate poor posture leading to anterior head carriage (AHC) and internally rotated shoulders. Thus, sitting like this for however long throughout your day can equate to pain and/or dysfunction. Particularly at major segments in your cervical spine (neck), mid-thoracic spine (upper back), and gleno-humeral (shoulder) joint. First, we basically want to strengthen what is weak and relax what is tight. Part of this process is made simple by learning a few strengthening exercises and relaxing stretches you can do at home or even in the office. The strengthening exercises include Deep Neck Flexor Activation, Seated Rows, and Standing Pulls, and the stretches include, Bruggers, Seated Thoracic Extension/Thoracic Extension with a foam roller, and Doorway Pec Stretch. If done regularly and properly, these exercises can have positive, long term effects on your symptoms, and the great news is that we teach patients how to do these exercises everyday in our offices! In conjunction with strengthening and stretching, spinal manipulation can be a useful tool for relief of UCS. It will help release those restricted areas, increase range of motion, relax the soft tissue, and inhibit pain. The combination of proper exercises and spinal manipulation has been proven to be very effective in countering the effects of UCS. Strengthening and stretching will help assist your posture while driving and sitting at work, but not 100%. It is important to be mindful of your body and workstation positioning. I like to tell people to imagine "putting your shoulder blades into your back pocket." Meaning, keeping your shoulders back and down. Use of low back support to maintain that normal curvature in your lumbar spine should be used at all times. If you don't have a lumbar roll/support (which can be purchased in our offices), rolling up a towel and placing it in the small of your back should do the trick. Looking down with your eyes instead of looking down with your neck will help reduce the stress placed on your spine. Refrain from having the screen off to the side, and turning your neck in one direction for extended periods of time. Standing desks are becoming more and more common in the work place and should be taken advantage of if available. Avoid sitting for longer than 20-30 minutes by taking frequent postural breaks and walk around for 1-2 minutes, providing your body with a change in prolonged positioning. UCS is becoming more common with the amount of time people spend sitting throughout their day. We need to move more. Aside from a change in career - which is not likely for most people, these tools can help with relief. We see the effects of sedentary lifestyles ever day in our offices; headaches, neck pain, back pain, fatigue, joint dysfunction, weight gain, the list goes on; and we know how important increased movement is in relieving the symptoms. It's time to make a change and to prioritize feeling better. We can help. We want to get you back to your favorite activities and to get you feeling your best. You just have to take the first step - give us a call! We tell so many of our patients to slooowww down while doing their exercises. Why? Think about it this way....if someone is trying to instruct you how to do a new task, but they're talking wayyy to fast for you to understand the directions they're giving, how well do you think you'll be able to perform that task? Probably not very well, right? Okay, well the same thing goes for your body. If you move too fast, your brain doesn't have enough time to instruct your body how to do the movement properly...and that right there is the key, doing it properly! The combination of your nervous system and your muscles working together to produce movement is called your neuromuscular system. This system communicates at a certain speed, which varies among individuals and even specific movements. So, for example, if you are squatting faster than the rate of that communication the margin for error in that movement pattern increases. So slow down, enjoy the movement, and give yourself (and your body) enough time to make sure that you are doing your exercises properly! Not only does this create healthy and proper neuromuscular movement patterns, but it helps you get the maximum benefit from your exercises, too!